30 Oct Introducing the Los Angeles Narcolepsy Education Day – You’re invited! 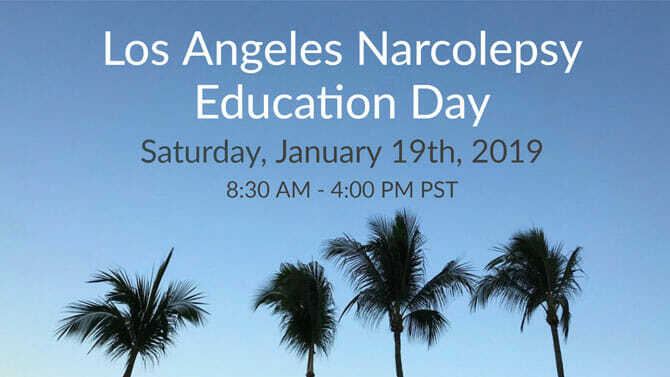 The Los Angles Narcolepsy Day is a one day conference for PWN, their families, educators, clinicians and researchers. Leading experts will be sharing their latest research on treatment options, impact of narcolepsy, comorbidity and how to live a full life with narcolepsy. Presentations from Dr. Emmanuel Mignot, Mali Einen, Dr. Jason Ong, Dr. Chad Ruoff, Gina Dennis, Veronica Moore and Dr. Miyoung Hammer will address pertinent issues around a diagnosis of narcolepsy. Break out sessions include how to thrive with narcolepsy, lessons on the Ketogenic diet, engagement with clinical trials and round table forums with pharmaceutical companies, as well as expert panel discussions. Lunch and coffee are provided with admission. Registration is $25.00 for this event. The conference is located in Pasadena (LA County) close to Downtown Pasadena and within walking distance of hotels and resturants. It’s an ideal destination for visiting Disney Land, Universal Studios and Downtown LA and is approxiamtley 45 minutes from Los Angeles International Airport.